Explore the artistic evolution of Wassily Kandinsky, a master of modern art, in this must-see exhibition. An amazing collection of paintings and other works from the Centre Pompidou, Paris, traces the development of this extraordinary and inventive artist, from his early figurative works to his most modern pieces. Alive with color—and rhythmic—Kandinsky’s distinctive, abstract style made him one of the most influential artists of the twentieth century. 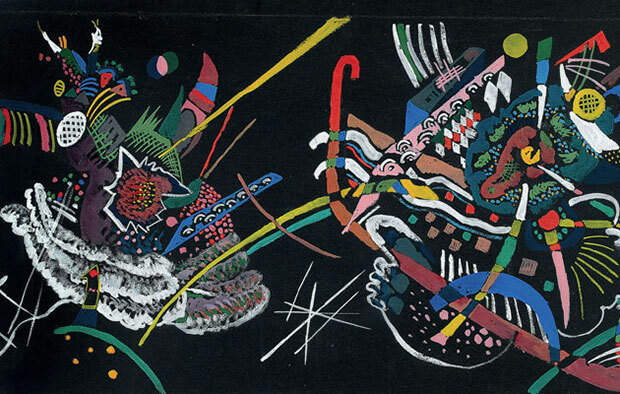 Together with the Centre Pompidou in Paris, the Museum is proud to present Kandinsky: A Retrospective . The Centre Pompidou is one of the major repositories of Kandinsky’s work. Its remarkable collection came from the artist’s widow, Nina, and is composed of the artist’s favorite works, which he kept for himself. Curated from this rich trove, this retrospective features over one hundred paintings, drawings, and other works, representing every period of the artist’s four-decade career. 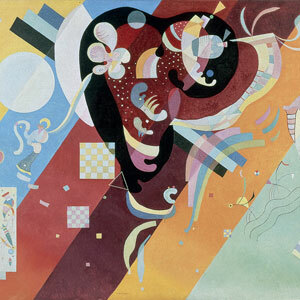 Another highlight of the exhibition is a mural that Kandinsky designed during his Bauhaus years—a piece that is being presented in the United States for the first time at the Milwaukee Art Museum. 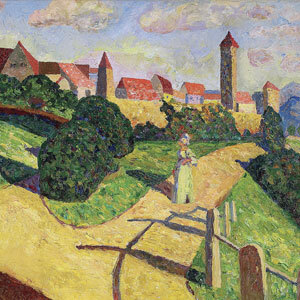 Chronological in its presentation, the exhibition opens in the early 1900s, with the landscapes and figurative works that Kandinsky created in Munich, one of the avant-garde capitals of Europe. There he experimented with Art Nouveau, Impressionist, and Post-Impressionist styles. In 1911, Kandinsky and Franz Marc formed Der Blaue Reiter (The Blue Rider). The two artists sought to combine various forms of creative work (painting, music, popular arts, children’s drawings) and different schools of thought to bridge traditional artistic divides. Treasures from the Museum’s Bradley Collection are included and represent artists active in the Blue Rider group. That same year, Kandinsky published Concerning the Spiritual in Art , in which he defined painting as an act resulting from an inner necessity. This publication has become one of the most important and widely read artist treatises of the twentieth century. When war was declared in 1914, Kandinsky felt obligated to return to Russia and was appointed to various prestigious posts, including the People’s Commissariat for Education. He painted few canvases at this time but produced many watercolors and drawings. 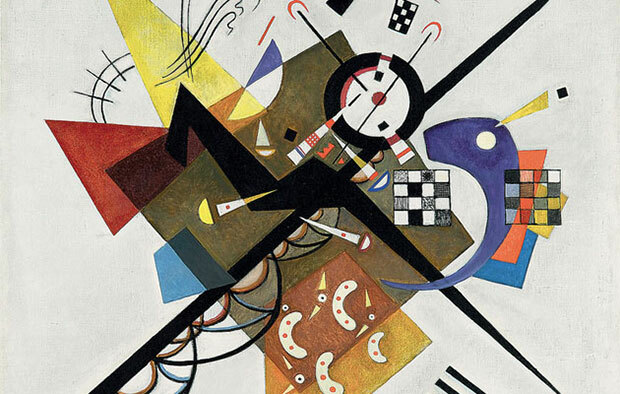 Although Kandinsky’s Russian period fluctuates between figurative and abstract art, once he was exposed to the works of Suprematist and Constructivist artists, his own work shifted to a more geometric style. 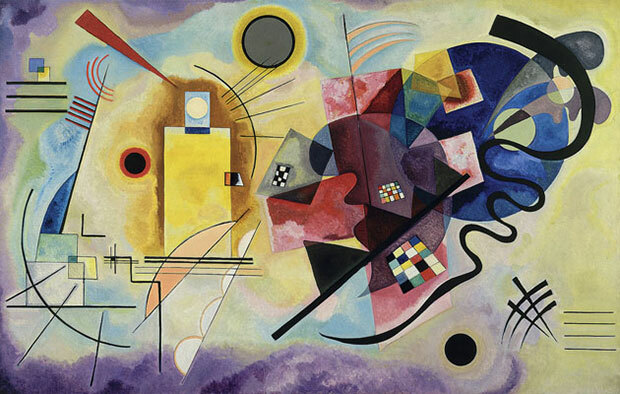 In 1922, Kandinsky was invited to teach at the Bauhaus in Weimar, Germany, where he threw himself into an intensive period of artistic and theoretical production. With his students, the painter worked on monumental decors, including the murals that he designed for the lounge of the Juryfreie exhibition in Berlin. The rise of Nazism in 1933 led to the closure of the Bauhaus and abruptly ended this creative period. 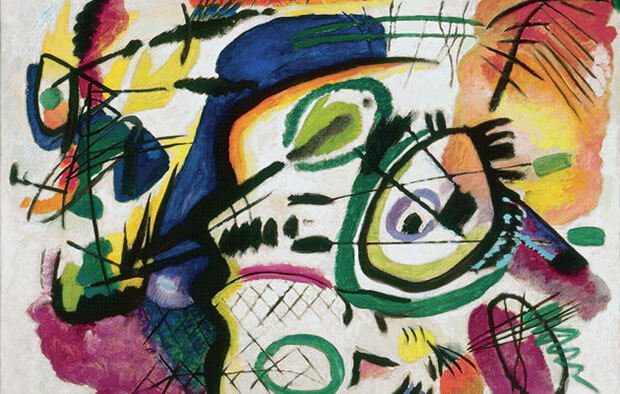 Kandinsky left for France. In Paris the painter met the Surrealists, including Joan Miró, Jean Arp, André Breton, and Max Ernst, and was producing works with organic shapes, inspired by photographs of cells and tissue. His work started to gain widespread recognition in the 1930s, especially abroad. 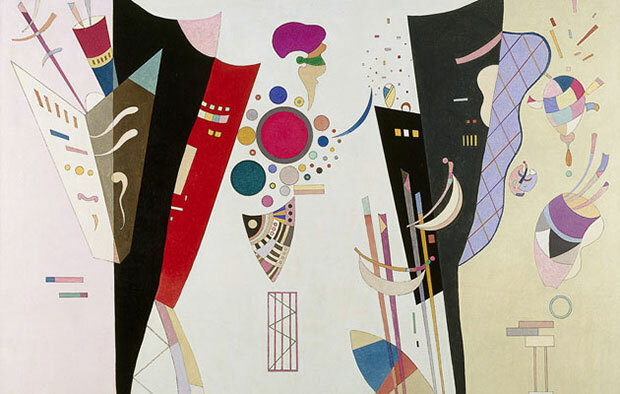 In 1935, he exhibited with the artist group Abstraction-Création in Paris, and in 1936 he took part in the exhibition Abstract and Concrete in London . The painter completed his final watercolor in 1944, and died soon afterwards in Paris at the age of seventy-eight. Today he is considered one of the most important and revolutionary artists of the twentieth century. This exhibition is organized by the Centre Pompidou, Paris, and the Milwaukee Art Museum. It has been co-curated by Angela Lampe of the Centre Pompidou and Brady Roberts, chief curator of the Milwaukee Art Museum. The exhibition travels to the Frist Center for the Visual Arts in Nashville, Tennessee, September 26, 2014–January 4, 2015. The exhibition is supported by an indemnity from the Federal Council on the Arts and the Humanities. Additional support is provided by Associated Bank, Christie’s, the Milwaukee Art Museum’s Friends of Art, and the Wisconsin Department of Tourism.